Note: Any and all descriptions of sculptures and activities are for 2009. The sculptures are guaranteed to change, and some of the activities may also change. It’s best to check just prior to going. 5-chome brought a little ice and eco awareness to the festival. The first part was an Eco Plaza. This was essentially a place to put windmills and other eco friendly stalls. It was easy to forget this section as it was there to promote ways to save money and the environment. If I could understand Japanese a lot more, I would have enjoyed it. Unfortunately, it was too difficult at the time, and too cold, to really appreciate it. The main attraction was the Hakodate Bugyo Chousha. This is the original government building, located in Hakodate, to govern all of Hokkaido. It was destroyed but it is currently being rebuilt. It should be opened in 2010. The park is well known in Hokkaido. This sculpture was made out of ice, and lit up with various colours at various times to coincide with special shows. Unfortunately, they turned off the lights as I was about to start taking pictures. It was beautiful though, and how a large ice sculpture should look like. 6-chome was a place that I could easily forget. It was the site of the food park. One block where all they did was sell nice hot food for the hungry festival goers. I would avoid this block as a lot of the food didn’t look that good, and I was already full from dinner. 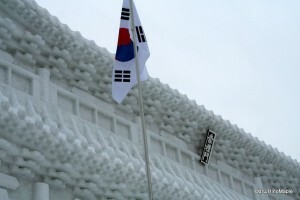 7-chome was the first site of the first non-commercial snow sculpture. They recreated, to scale, Sungnyemun. It is the main gate that allowed people to enter Seoul. Having been originally built over 500 years ago, it was a national treasure. Unfortunately, an arsonist burned the structure down in 2008 and the wooden structure was destroyed. The stone foundation was still standing, and thus they will be capable of rebuilding this beautiful structure. Thankfully, the Korean government did an extensive analysis of the structure prior to it being burned down, so they know how to rebuild it. Unfortunately, we don’t know when it will be rebuilt, but hopefully it will be sooner than later. 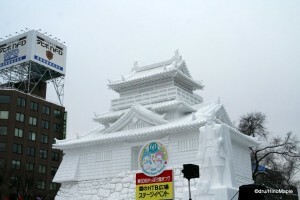 While this is a non-commercial sculpture, it was sponsored by HBC (Hokkaido Broadcasting Company), so their name is featured in all advertising, and below the sculpture itself. In this day and age, it’s hard to get anything done without sponsorship. 8-chome brought another beautiful sculpture. Hamamatsu castle, located between Tokyo and Osaka, was recreated. While it isn’t the most beautiful castle, or the most majestic, it is, as any other castle in Japan, historical. I can’t help but feel it was recreated because they ran out of other famous historical buildings to recreate. I will admit that it was more beautiful and more detailed than Sungnyemun. This one was also sponsored, by HTB (Hokkaido Television). Behind Hamamatsu Castle, they had a mid sized snowboard ramp. They had small competitions and demonstrations for people to watch snowboarders in action. I doubt it was very special. I find watching a half pipe competition to be more exciting. 9-chome saw a large reduction in the size of the sculptures. 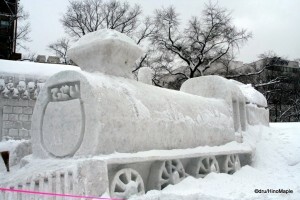 A mid sized sculpture of a train and station was the main attraction. 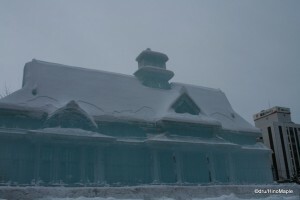 The only problem was that the station was hard to see, and the train was covered in fresh snow. I’m sure it could have looked better, but unfortunately, it seemed to have been rushed a little. Thankfully, the rest of this block was comprised of various other sculptures that were no bigger than 2 metres in height. Unfortunately, with so many people, it was difficult to take any pictures. I might suggest going before 10am, as the festival officially opens at 10am. This entry was posted in Festivals, Hokkaido and tagged Bugyo Chousha, castle, Eco Plaza, festival, food park, Hakodate, Hakodate Bugyo Chousha, half pipe, Hamamatsu, Hamamatsu Castle, HBC, Hokkaido, Hokkaido Broadcasting Company, Hokkaido Television, HTB, ice sculpture, japan, Korea, Odori, Odori Park, Oodori, Oodori Park, Sapporo, Sapporo Snow Festival, Sapporo-shi, sculpture, Seoul, Snow Festival, snow sculpture, snowboard ramp, station, Sungnyemun, train, train station by Dru. Bookmark the permalink.